Wallwik's patented HydroSheet technology allows wallpaper to be removed more easly and quickly than ever before. 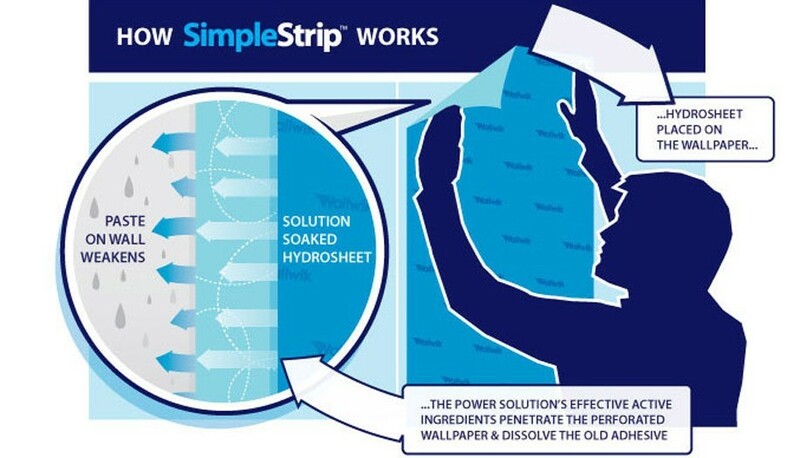 When soaked in the SimpleStrip Professional Power Solution, the HydroSheets cling to the wallpaper, keeping it moist. Enzymes can then penetrate the scored surface and dissolve the old adhesive. You then simply peel the paper from the wall, often in entire strips. For this step, you need the patented SimpleStrip Hardened Scoring Tool. Simply press it against wall and roll it across the surface of the old wallpaper. You do not need firm pressure, just enough to allow the teeth to cut into the surface. This is where the proven technology in SimpleStrip Professional really starts to work. You soak the HydroSheets in the Power Solution and then hang them on the surface of the old wallpaper. The enzymes in the solution then eat their way into the old adhesive, rehydrating it. You can use the SimpleStrip Professional Power Sprayer to get even better penetration. After just 30 minutes, the old paper is almost as moist as it was when it was first hung. Simply pick a corner of the HydroSheet and gently lift it away from the wall. The old wallpaper should come away with it. Peel diagonally across the wall until you have a complete strip, then peel carefully downwards. 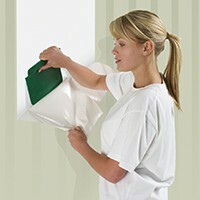 The HydroSheet provides support for the old wallpaper, reducing the likelihood of tearing. Usually, it should all come away in one piece. When you have finished, simple lift the old wallpaper strip from the HydroSheets and dispose of them. You can reuse the HydroSheets, so just rinse them in the sink and let them dry.